Also known as Nelson Mandela Bay, Port Elizabeth is often spoken of as the friendly city due to the wonderful nature of the cities population. Port Elizabeth is now not only a commercial site but a tourism and adventure hub as well. Business is no longer the sole reason people travel to the city. Wether you are flying to Port Elizabeth on business or pleasure we will make sure that you find cheap flights to Port Elizabeth. Port Elizabeth offers a relaxing and calm feeling, whilst offering all the luxury and entertainment of a big city. Signup to our newsletter to get the latest flight specials to Port Elizabeth. Port Elizabeth, like Cape Town, is also referred to as the windy city, which is quite true as there are some very windy periods during the year. PE has a subtropical climate with light rain throughout the year. The area lies between the winter rainfall of the Western Cape and the summer rainfall of eastern South Africa. Winters are cool but mild. Summers are warm and considerably less humid. We assure you that you will find the most comprehensive range of flights to and from Port Elizabeth right here. We give you access to our FREE booking facilities which guarantee cheap flights at any single time. We bypass the thousands of booking agencies and give you direct access to the airlines themselves proving time and time again that we are the leader when offering domestic flights South Africa. We are comparing more than 4 million flights to Port Elizabeth annually to ensure that you receive the best deals. Mango, Kulula, FlySafair, Flysaa are some of the airlines offering up the cheapest flights to PE. Many of the more popular routes to Port Elizabeth include; Flights from Johannesburg to Port Elizabeth, Flights from Durban to Port Elizabeth and Flights from Lanseria to Port Elizabeth. If you are visiting Port Elizabeth as a tourist then the best time would be during the summer time which is between the months of December and January. This is the festive time of the year for the Friendly City where it comes alive with a large variety of sun filled activities. 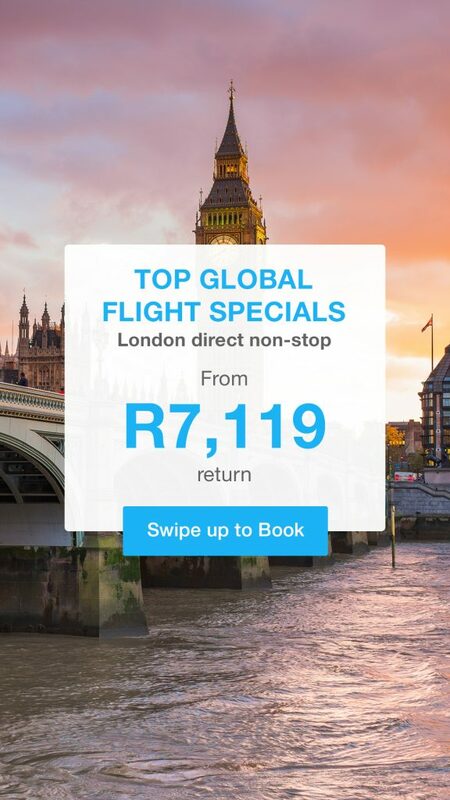 Unfortunately this is probably the most expensive time f the year t find cheap flights to Port Elizabeth as it falls right in the middle of the holiday season where flights are in demand. Mango flights to Port Elizabeth will be available at this time of the year together with Kulula cheap flights but in general be prepared to pay a premium for flights to Port Elizabeth at this time of the year. Explore The Donkin Heritage Trail – take on the five-kilometre trail that follows in the footsteps of the famous 1820 Settlers. It links more than 47 national monuments and historical sites in Port Elizabeth and is named after Sir Rufane Donkin, the acting governor of the Cape Colony at the time. This trail includes some interesting facts about the area that will educate you about the cities history. Addo Elephant Park escape to the bush and spend your time scouring the pristine Eastern Cape landscape for wildlife at Addo Elephant Park. This is home to over 550 elephant and is the third largest national park in South Africa. It has expanded to conserve a wide range of wildlife and flora from the semi-desert Karoo down to the coastline of Sunday’s River Valley Mouth. Blue Flag Beaches two of the total of 6 blue flag beaches in the Eastern Cape are located in PE. Humewood Beach and Wells Estate Beach have both passed the 14-point criteria and been awarded Blue Flag status. Visitors can enjoy a stretch of coast that has wonderful water quality and safety services, including excellent life-saving standard. So take advantage of the Port Elizabeth sunshine, head to the beach and catch those lovely sun’s rays. When searching for cheap flights to Port Elizabeth with Domestic Flights South Africa, you will be given options from most of the airlines listed above, giving you a wide variety of flights to choose from.